Corn seeds can be found when picking wild Corn plants. These seeds can be planted in the ground and grown to collect additional food. 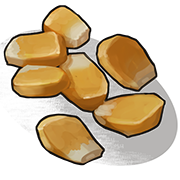 Planting these seeds in a planter, and then watering them with large quantities of water yields significantly more Corn and faster groth.